Harlequin Rasboras are a lively and colorful fish. The Harlequin Rasbora is a fine example of the Cyprinid family of fishes. They make a colorful and lively addition to any community aquarium. A planted aquarium will give them places to dart in and out, as well as set off their fiery color. They are great for people who easily become bored with fish, they swim about constantly and can be a bit boisterous! Not to be kept with shy or slow eating fish, they do well with other lively Cyprinids like tiger barbs and cherry barbs. Cyprinids are favorite fish for both beginners and experts, and are easily spotted because they have only one top fin! Cyprinid fish make very attractive, hardy aquarium fish. They are usually some of the first types of fish kept by beginning aquarists. But these popular fish grace the tanks of many long time fish keepers as well. They are members of the Cyprinidae family, also commonly called the carp family or the minnow family. This is a large family of freshwater fish containing many of the carp-like fishes and minnow types. They can be found throughout Asia, most of Africa, Europe, and North America. The only place they are not to be found is South America and Australia. They come in all sizes from giant game fish to numerous small species less than 2 inches (5 cm). Included in the Cyprinidae family are well-known aquarium favorites such as barbs, danios, rasboras, and various freshwater sharks. One of the best fish in this group for algae control is the Chinese Algae Eater. This family also includes minnows, bitterlings, daces, asps, roachs, flying fox, and chubs. Goldfish and Koi are also part of the Cyprinid family. However these very popular fish are quite distinctive. Rather than including them here we have provided them with a complete Goldfish section of their own. Many Cyprinids make great fish for the beginning aquarist. They are undemanding and easy to care for. They can do well in most water conditions, though they will usually prefer soft, slightly acidic water. They do like their environment kept clean, so will need regular partial water changes. The aquarium temperatures they require are consistent with what is needed for most tropical fish, with a range around 75° F (24°C). If kept in a school they will usually swim out in the open. Bright lighting and distractions outside of the tank will not be a big concern, unless it is feeding time, and then they will be excited! The Cyprinid list below includes popular species as well lesser known types. Each fish guide has a description of the species, its place of origin, habitats and behaviors, as well as fish care to successful maintain them in an aquarium. Fish pictures are also provided within each fish guide to help with identification, and to aid in choosing the best type of Cyprinid fish for your freshwater tank. Cyprinids are members of the Cyprinidae family. The name Cyprinidae is derived from the Ancient Greek word “kyprinos” which "carp". Thus they are commonly known as the Carp family, as well as the Minnow Family. Cyprinidae is a family of soft-finned fish in the Order Cypriniformes, which is one of five orders contained in the Superorder Ostariophysi. The Cyprinidae family is found in North America, from northern Canada to southern Mexico, Africa, and Eurasia. These fish have long been used as a highly important food fish, and are fished and farmed throughout Eurasia for centuries. They are also important in the aquarium industry, rivaled only by characins like the Tetras, livebearers like Guppies, Swordfish, Platy, and Molly types, as well as the fascinating cichlids. 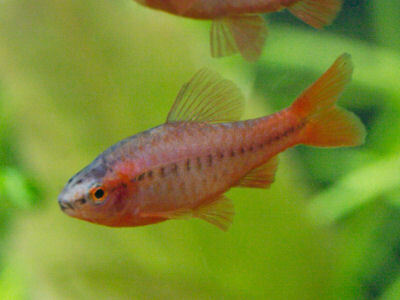 Some of the most popular species in this group are the Barbs, Danio, freshwater sharks like the Black Shark and Rainbow Shark, and the Rasboras. The Cyprinids consist of fish of all sizes. They range from giant game fish to numerous small species less than 2 inches (5 cm). The smallest known member of the Cyprinidae family is the Micro Glassfish Danionella translucida. It is found in Burma, also known as Myanmar, in Southeast Asia. This tiny fish reaches less than half an inch (1.1 cm) in length. When Roberts described it in 1986, it was considered to be the smallest freshwater vertebrate. There are only two described Danionella species, and a few more not yet described types. These Cypriniformes are reckoned to be the smallest freshwater fishes in the world. The largest fish in this family include the Giant Barb or Siamese Giant Carp Catlocarpio siamensis, which can reach up to 9.8 feet (3 m). It is found only in the Mae Klong, Mekong and Chao Phraya river basins in Indochina. Due to habitat loss and over fishing, its populations have drastically declined and it is now considered to be a critically endangered species. Another of the largest members is the Mahseer Tor putitora (Previously Barbus tor), also known as the Golden Mahaseer or Putitor Mahseer. It is widely distributed in south and Southeast Asia and reaches a length of more than 6 feet (2.5 meters). The largest Cyprinidae species in North American is the Colorado Pikeminnow Ptychocheilus lucius, previously known as the Squawfish, which can grow up to 6 feet (1.8 m) in length. The Cyprinidae are typically stomachless fish with toothless jaws. They can be with or without barbells. They will usually have thin lips and usually a protrusible upper jaw. The mouth can sometimes sucker-like on some species. They have cycloid scales, meaning their scales have smooth margins rather than toothed. Some characteristics of Cyprinidae come from commonalities found in all the fish belonging to the Superorder Ostariophysi, as well as commonalities found in members of the Cypriniformes Order. As members of the Ostariophysi Superorder, a common characteristic is that of possessing a Weberian apparatus. The Weberian organ is an anatomical structure that connects the swim bladder to the auditory system, or hearing organ. It functions by transmitting auditory signals, which are then amplified to noticeable levels. A unique feature of the fishes in the Cypriniformes Order are that rather than having teeth in their mouths, they have one to three rows of teeth in their throat area on what is called the pharyngeal bone. There is also a bony plate at the bottom of the pharyngeal bone to grind food. Another Cypriniformes characteristic is that they also lack an adipose fin. This is a second, posterior dorsal fin. This is more characteristic of the Characin fish, as seen on the familiar Tetras, Hatchetfish, and Silver Dollars for example. There are over 2,400 species in about 220 genera. This family is rivaled in size only by the Gobies of the Gobiidae family and possibly the Cichlids, family Cichlidae. There is so much diversity in the Cyprinid species that it has been difficult to determine their exact assignment to subfamilies. The evolutionary development and history of the various species makes it more than tentative in many cases. Some have obvious distinct lineages, but then there are many close relatives. The overall systematics and taxonomy of the Cyprinidae remains a subject of considerable debate. Below are the current suggested Subfamilies of the Cyprinidae Family. Still there are many species that are considered “incertae sedis”, which means the genus/species is of uncertain placement. These species are currently contained only within their genus rather than assigned to subfamilies. “Incertae Sedis” - Genus/species of uncertain placement.